If a picture is worth a thousand words, can I choose two and not be blamed for talking too much? Whether on satellite television, newspapers, internet-based news portals, social media or the blogosphere, the images of Palestinians, joined by Lebanese marching peacefully towards the southern Lebanese city of Maroun Al Ras, towards the border with Israel, the border of Palestine, to commemorate 63 years since the Nakba were incredible. 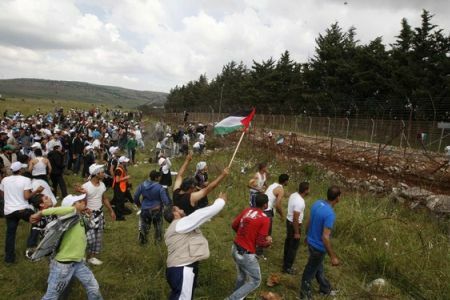 Nakba Day protests on Lebanon’s southern border with Palestine. Passing the rolling green hills, the young’s only weapons were their flags in one hand and a bundle of the stories of the land lost in the other. The occupied land, with its orchards and olive trees immortalized by the stories of Ghassan Kanafani and Elias Khoury was their only target. And joined by the elderly, whose only weapons were the fading memories of a land they used to call home, with ownership deeds in a language no longer spoken in their land, with keys for locks long broken and replaced. 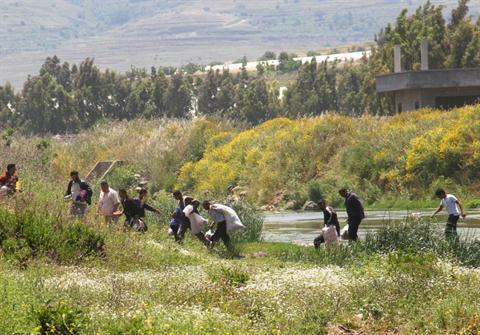 Syrian refugees corssing the border Nahr al-Kabir River into Lebanon. Source: The Daily Star. At the same time, those very same satellite channels, newspapers, internet-based news portals, social media and the blogosphere showed images further north, of Syrians fearfully marching as fast and far away as possible from their own borders as they could, seeking shelter with their neighboring Lebanese from their own country as best they could. Passing the rough terrain of makeshift crossings, with no weapons except for the memories of horrors they had left behind. Some entire families crossing and staying, while others left their families in safety, while their country, its freedom and the struggle to obtain it remained their only target. Perhaps those ushered to safety may have been joined by many more, but even in times of hardship, it is not easy to abandon everything and flee from one’s own land and not fight against injustice and tyranny.